I was wearing my new shoes today – and when I was in line at Starbucks, a complete stranger was all, I love your shoes! and I told her that she could go get her own, at Target! and that they were cheep cheep. Then in a span of less than 1 minute and not sure how, I found out that she just turned 39-years-old, was married 13 weeks ago and is 11 weeks pregnant! Folks in Texas sure are more friendly and open than what I am used to! On to my run… I had run 10 miles on Sat, then yogidy on Sun, but nothing Mon or Tues morn. And then I had an ice coffee this morning waiting for the repair man to come – and a skinny cinnamon dulce latte in the afternoon – I really figured that I would need to go for a run to be able to sleep tonight, with all that caffeine coursing through my veins. It was like running on clouds! So lovely. My good friend, K, is having a birthday soon! So I figured I would make her my favorite gift – a shoe bag. I also did a shoe bag for my sister for her trip to Ibiza – check it out here. And here is the first drawstring shoe bag that I ever made – it is me in my green jacket! ART 180, one of the non-profits I was very involved with in Richmond, is celebrating it’s 10 year anniversary this year. They did a very cool campaign where people would create (in the size of a dollar bill) something that showed what that person would like to see in their community. Along with a $10 donation, the goal was to get 1,000 “Change for a Ten” creations. I like how it turned out! I stamped on and embroidered the fabric, and backed it with brown felt. It was a kind of hard for me to put into words what I’d like to see changed in my community. But I boiled it down, and put it as succinctly as I could. It was a good exercise for me to do that – and I bet for others as well. I got a harried txt msg from my friend / interior designer on Friday – Go to Brown on W. Alabama! They are having a huge sale – you can get floor lamps, table lamps and tchoskies. I decided that Boom and I should go to Brown (I had been there before – and liked the stuff she has!) right when it opened on Saturday. So, after running 10 miles, we headed over to Brown and were there by 10:04am. I figured it would be best to be there early to get the pick of the litter and I had a work brunch that I had to be at by 1130am, so we were on a kinda tight schedule. Brown has a ton of old / new / vintage / antique lighting – and a little bit of furniture and random tchoskies. We ended up getting a bunch of stuff! And at a pretty good price, but it was still a lot to purchase all at once. A “trophy” lamp – could be used in Boom’s office, or maybe in the living room. It is quite large – somehow in the store it didn’t seem that big to us. It’s old, but newly rewired. An old, handmade milk jug. I think this is so cute! And I love how it looks in the house – gives the hallway more personality and is really nice to have something old and beautiful in such a new house. An old Belgium table – wood top with an iron base. It is heavy (per Boom, who had to carry it from the store to the car, and then from car to inside house). I am not sure where we will use it – maybe as a coffee table in the upstairs landing media area? Regardless, I really love it so it will be put to good use somewhere. An awesome chandelier! I love love LOVE this piece! It is an original design of Jill Brown (store owner) – she uses old parts that she gets in Europe, and fashions them into a chandelier. So it has the feeling of something old, but works like new. And it is huge – 4 feet long! But that is perfect for our living room – it has high ceilings. So we’ll be getting rid of our ceiling fan and putting this chandy in it’s place. It will really help lower the ceiling. And the blue-ish gray paint is perfect for our color scheme! Boom and the shop owner really bonded after I had left for my brunch – he had to get the checkbook – so when he came back, they really chatted it up. Which is great – she seems like a nice lady – and has great taste! She really loves the things she is selling. I want 2 of the same ceiling lanterns to put over the rectangular kitchen table we’ll be getting at some point. and I suspect I’ll be getting them from Brown. Slowly but surely we are getting the living room in order. Just have multiple rooms to go (and the living room is not done, by any stretch of the imagination)! My mantra – it’s a marathon not a sprint! Friday night – Rehearsal dinner: Very casual, bbq and bluegrass. Kandy A & Jams -the happy couple! You can kind of see here how ripped Kandy A is – she was looking very thin and muscular! She is an ultramarathoner – she has done the double Boston a multitude of times! I really wish I had thought about and prepared a little toast. My surprise coming home party (after finishing the Atacama Desert race) was the night of Kandy A and Brokeback’s first blind date. I remember her telling me that he had 2 marks aganist him, before she even met him! 1) he was a lawyer, and 2) he used hair gel (told to her by the gal – his stepsister – that set them up! side note – he no longer uses product in his hair). AND Boom and I saw them the night they got engaged! It was the same night as the Richmond SPCA’s FurBall. Kandy A told us how Jams proposed, and Boom and I took that and used some creative license to reenact the proposal to Cubs and Immy, whom we saw later that night. But I didn’t – I blame Stupid Ike – he caused a lot of stress and I was unable to think of much else. Wedding ceremony was very nice – outside and Kandy A looked so beautiful!!!! Kandy A was wearing a gorgeous Monique Lhuillier gown – it was strapless and fitted and had a mermaid train. Just perfect for Kandy A and she looked so awesome! Her hair was beautiful as well! Even from the back – which is the view that I had. Evidently it took a long time to do. Well worth the time! Reception was fun! The band had Ben Folds’ brother (as in Ben Folds Five) – Chuck Folds – in it. Their first dance was to a Ben Folds Five song – very untraditional but perfect for them! Delta Force – back together again! There were quite a few Seal Team members in attendance, along with Johnny M. So you know what that means…. All the ladies lifted Kandy A – with Johnny M on the mic, leading the counting!!! Don’t worry, it was first brought up by Kandy A (so clearly she wanted it to happen) and people cleared it with both her mom and dad. Here we are with Johnny M and his wife. The reception ended around 11pm, but it was so dark and we were so tired, that it felt like it was 2am! Cubs and Gretty got up at the crack to get Boom and I back to RIC for our 930am flight – it was early! but good to be back in H-town (with electricity) relatively early on Sunday. A very good time overall – really great to share in their special weekend while getting to see good friends and other random Seal Team members! As soon as Ike arrived, we had no electricity. For about a week. It was a huge pain in the arse. And because the cold front did not come through immediately after Ike (it took a few days), it was still hot during the time where we were cleaning up the yard. As Boom eluded to in his last comments, I could not be outside for more than 10 seconds before hordes of mosquitoes desended on me and starting eating my flesh. For that reason, I was not much help with the debris clean up in the back and front yard. And since we didn’t have any water during the first few days after Ike, I couldn’t use bug spray because I would have no way to get it off. So I had to find something to do to with the daylight hours – I really wanted to sew, but the sewing machine requires electricity. My answer – decoupage! (Paper glued on something using mod podge to glue and/or seal) I kind of got obsessed – I had a few things set aside that I wanted to decoupage anyway, but never had any time, so this was the perfect chance! 2 round containers with lids, 2 box bottoms with no tops, and 1 box with a lid (far right). 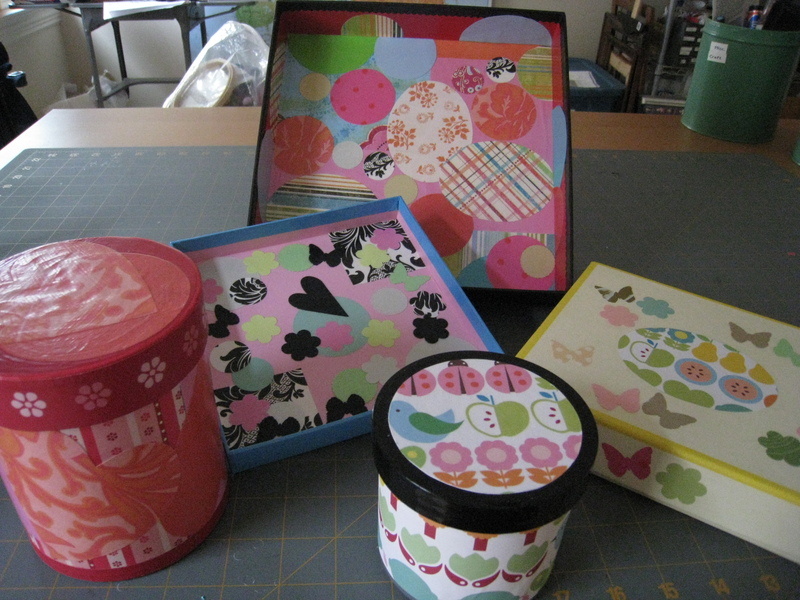 It was a little addictive – I would have decoupaged more, but I had nothing else to decoupage! The cute paper on the little round container and in the middle of the box with a lid is Martha Stewart, of course. I really think Yarbs and I need to get more fun punches! She has a great butterfly punch, and I have a flower punch, but I want more! Ike blew threw here last week, and lots of folks are still feeling the effects of it. Yarbs and Josephine still don’t have power! Which totally stinks for them. They are bunking up here with us – we have lots of room and power! I am just really thankful that we had no structural damage to our house and that we all stayed safe! At least now I have my first Houston hurricane under my belt… I just hope there is not a repeat performance any time soon!